If you have been to the coffee shops of Amsterdam and tried legal hashish, it's likely that it came from Morocco. Morocco is the world's largest exporter of the sticky cannabis resin, and although it's illegal to grow, harvest, possess or smoke it in the country itself, doing so is commonplace. If you're planning a backpacking trip to Morocco, it's likely that you will be approached at some point and offered hashish, which is known locally as kif. For some travelers, sampling Moroccan kif in its place of origin is one of the main reasons to travel there in the first place. While TripSavvy does not encourage or endorse any illegal activity (particularly when traveling overseas), it is a fact that many people use hashish when they are in Morocco. This article aims to inform them about the issues surrounding the drug. It's not known exactly how long cannabis has been cultivated in Morocco, but the tradition is thought to have been introduced by Arabic invaders in the 7th century. 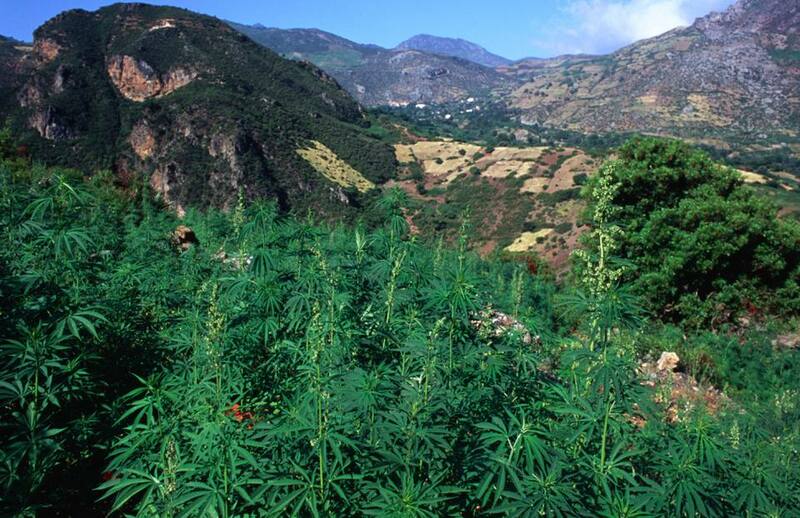 Originally, cannabis farms existed to support local demand for kif, which is smoked socially in many areas of Morocco. It was legal in some parts of the country until 1956, when the newly independent government prohibited production nationwide. Despite the ban, the kif industry continued to thrive and in the 1970s it expanded exponentially due to an influx of hippie travelers from Europe and North America. Kif farmers began growing for export and today Morocco is the world's largest exporter of cannabis resin. Moroccan hashish, usually called Maroc, is widely sought after internationally. In 1890, Sultan Hassan I of Morocco gave five villages in the central Rif Mountains special permission to cultivate cannabis while restricting its growth elsewhere in the country. This established the region as the country's premier hashish producer and today, most of Morocco's cannabis is still grown and processed here in what has now become a multi-million-dollar industry. In fact, the region is now so synonymous with cannabis that some of its towns have earned a reputation as havens for backpacking stoners. Mellow Chefchaouen is the most famous of these, and its blue-painted streets are often laced with the scent of weed smoke. However, not all Rif Mountains towns are so safe. In places like Ketama, law enforcement are less tolerant and often pose as drug dealers – making it more likely that you'll be caught and prosecuted. Generally speaking, kif is readily available in many areas of Morocco. It's especially easy to come by in Chefchaouen, the kif-smoking capital; and in the major tourist areas of big cities like Marrakesh and Fez. Dealers typically approach you and not the other way around, usually after dusk in busy places like Marrakesh's Djemma el Fna square. As with most other wares in Morocco, haggling is expected – however, the longer the transaction takes, the higher your chances are of getting caught. Obviously, buying illegal drugs from strangers in public places is never a good idea, no matter how tempting it may be. The language barrier makes it especially difficult to be sure of what you're buying, you don't know whether the hashish is pure or if it has been mixed with harmful substances and the chances of a police set-up are high. If you aren't interested, don't be afraid to say no politely but firmly before moving on. If you're not familiar with hashish, you may be surprised by its appearance. Although it is a form of cannabis, it has been processed to resemble a sticky, brown clay which differs in color depending on the type and quality. It can be crumbled and mixed with tobacco then rolled into a joint; or smoked in a pipe. You can buy small pipes (sebsis) or water pipes (hookahs) in most markets around Morocco. In every Moroccan city, you will find small cafés where local men smoke their water pipes while playing cards and drinking mint tea. These places are probably the best places to smoke for men (as long as you're accompanied by a local). Female tourists, on the other hand, will be out of place in these cafés and may feel more comfortable smoking in a stoner-friendly hostel or guesthouse. Many tourists also smoke on a beach or in other nature spots away from the general public. Smoking in public is inadvisable and you should always avoid traveling with hashish in your possession. If you're caught buying or smoking hashish, the penalty can be up to 10 years imprisonment. Although law enforcement are often tolerant of the industry (especially in known smoker towns like Chefchaouen), tourists are sometimes made an example of. If you do run into trouble, enquire about paying a spot fine rather than being arrested and taken to prison – although these fines are often pricey, they are far preferable to a night or more in a Moroccan jail. This article was updated and re-written in part by Jessica Macdonald on April 16 2019.